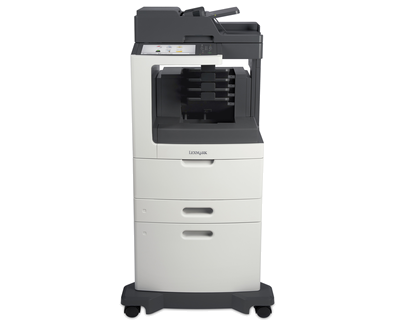 The modern Lexmark MX810DXME MFP is an excellent multifunction device for larger offices and workgroups. It is incredibly robust and can deliver output with a maximum resolution of 1,200 x 1,200 dpi. The Lexmark MX810DXME monochrome multifunction printer has a monthly duty cycle of 300,000 sheets and it can handle a wide range of media. It comes with built-in mailbox bin, 150-sheet automatic document feeder, and duplexer. The Lexmark MX810DXME mono laser printer is a bit large and is also pricey. This model weighs 218 lbs and measures 61.69 x 34.25 x 30 inches. It has a standard paper handling capacity of 2750 sheets and has a print speed of 55 ppm with the first page out in 4.8 seconds. The Lexmark MX810DXME all-in-one printer is integrated with 1024 MB of memory but it can be upgraded to 3072 MB. This device features a large touchscreen display on the control panel. For connectivity, the Lexmark MX-810DXME laser MFP has USB and Ethernet ports. This device is very quick whether printing, scanning, copying, and faxing. The MX810DXME multifunction printer delivers high quality output and offers excellent features including a USB host for direct printing and scanning. Aside from the duplexer, an RADF is also offered to allow the Lexmark MX 810DXME printer to handle double-sided originals for scanning. Since the Lexmark MX810DXME MFP laser printer is compatible with most operating systems and has Ethernet, networking is quite simple. Return program Lexmark MX810DXME cartridges are environmentally friendly and can be returned to Lexmark once they are empty for recycling. The scanner can only handle leger-sized originals and Wi-Fi connectivity must be bought separately. Expect the Lexmark MX810DXME black and white printer to have a large asking price. This unit may not be ideal for small offices.